This gal is sort of Winx but in pink and with a ruffled tutu instead of a kitty dress. Her hair is just a hoot. I might have gone a little crazy with the curls. My little 3 year old ballerina would LOVE her! She is lovely! I would love to give her a home with my own little curly topped girl! So nice of you to send her out in the world!! Oh my, she is so beautiful! I LOVE her curly, curly hair. And the ruffly skirt is to die for. My 3 little girls would certainly love to add her to their collection 🙂 Thanks for the chance to win her! Love her! And so would my curly headed four year old ballet crazy daughter. The color scheme you just is lovely. Oh my god! She is seriously adorable! Her hair is my favorite part. And I would wear that skirt with those tights. What a sweet little dolly with a great head of hair! My girl would LOVE her! She is so cute! My god-daughter would love her! I really need to stop being lazy and make her some dolls. Thanks for the inspiration you always provide! I just love her. She reminds me of my own pink hair phase! My own baby is due next Friday…what a sweet birthday gift! My daughter would flip her little lid! I adore her! She’s very cute. Oh…this would be solved by my curly haired ballerina! What a generous idea! My niece would love her. Oh my goodness! I think I want pink hair now! My daughter would love her! She’s absolutely gorgeous!! LOVE her hair! Beautiful doll. Adorable. Well done. She is adorable. My little princess ballerina would love her to pieces. The curly mop is irresistible! Love her, and so would my girls! I would love to take this beautiful girl home! Too cute! Hermosa! Me gustaria tener algo de Wee Wonderfuls!!!! Oh, I adore this. I have 2 little girls . . . which one would I give this to?? So sweet. I love her so much and so would my 4 year old. I promise to share if I win! Hi there, and how do you do? Thanks for being so generous! She is lovely! My daughter has put everything in your book a Birthday wish list. We just adore you. Truly wonderful! I love her spirit! Oh my, Sammi would love pushing her around in her little doll stroller! Love her. Would be perfect addition to my daughter’s handmade doll collection. Love love love!! So adorable. I know a little girl who would be crazy about that sweet doll! What a fabulous little doll, so cute! Would love to have her! I love that hair!! What a great doll. Gorgeous! Love her colors! Thanks for sharing such a lovely doll! She is adorable. My daughter would love her. adorable:) I love the hair. I have a 3-year old curly-haired ballerina here at home! She would adore this!! That is one wonderful doll – the hair is fantastic! I love her! She is too cute! I love the oodles of curls. Crossing my fingers and toes. My daughter and I would cherish her. What an sweetie 🙂 Love your dolls! It is fascinating to see the ‘in progress’ and then the finish! Very sweet! Loving the color combo…and her hair is the best part! She is precious. We would love to have her in our home. SO adorable, and I love the pink hair! As my daughter (3yo) would say “she is magically fantastical”. Thanks for the opportunity to win awesome dolls! oh what a sweet doll!! My youngest would love her! Thanks! She is just stunning! What a treat it would be to win this little beauty for my girl! Love the tutti-fruity curly top!!! Oh, yes please! She’s so beautiful! I love her loopy hair. Your dolls are just fabulous! She is adorable!! Love, love, love! Thanks also for the hair tutorial. It’s so fun to see the finished product! OMG! She turned out so cute. Love her. Oh my this doll is so cute! Is there a pattern or do you sell them? I just love the pinky hair! She’s so adorable! I love her little bangs! I have been meaning to make 2 little dolls (I’ve already made Kit for my daughter) for identical twins due in 3 weeks, ack!! We won’t know boys or girls until they are born, but either way this doll would be perfect! My two eldest (boys) first big gift from Santa was a doll house and they LOVED it! Win or lose, I adore your creations. My daughter turns 2 on Monday and I know she would just love to mug on this doll! I love her hair! She is very cute. Oh, I love her. And our Winx (named Irene) would be great friends with her, I’m sure. I meant to comment the other day, but we had fun finding Wee Wonderful friends throughout the Land of Nod Catalog too. Ella found her elephant – we missed it the first time. It was definitely a where’s waldo moment. How-do-you-do? Quite charmingly! And that’s a fact. Love your wee beauties. Just lovely! Pretty little babe! Thanks! LOVE your dolls! She’s a beauty! She’s a beauty! I have a niece with a first birthday coming up and this would be perrrrrfect! She’s a cutie…don’t know if I could give her to one of my daughters…I like her too much to share! What a cutie! My daughter would love her! What a lovely little dancer! She would make a perfect gift for my niece who is about to turn 3. Oh gracious. She’s adorable. She would be well loved between my three girls! Oh my, I love her! My little girl would too. I was wondering what the hair would look like finished- she’s beautiful! What a great idea! And everyone needs more yarn 😉 I’d love for her to live at my house. Woweee! She’s adorable. This would be timely for my daughter’s upcoming 3rd birthday! I love the pink! Adorable! So adorable! My girls would fight over it and the baby would lose. Poor baby! Adorable! The pink hair is delightful. Thank you for a great giveaway! I have two girls (one with a curly mop of her own) who would adore that doll to pieces. Fun giveaway! She’s gorgeous. Oh she is so sweet. 🙂 Thanks so much for the opportunity, my daughter would love her! Sweet! My oldest girl is a curly-top, too! Would love to win this for my grandbaby! Holy Moly! She is adorable! Thank you for sharing with us! OMG! Cutest thing EVER! I don’t have a little girl anymore as I’m an empty nester…I actually want this little cutie for myself! So cute! My little girl turns 3 in April and this would be a great birthday present for her! Gorgeous, gorgeous! My littlest loves dolls, as does her momma :). I’ve always admired yours! Love the colors and fabric too. Thanks for the chance! Excited to see your monthly creations! You are amazing HIllary, just beautiful! How adorable! Love it! Makes me want to set aside time to sew this weekend! Love her leo and tutu. When I got my Land of Nod catalogue, I had fun spotting all the wee wonderfuls, too. I’m sure it was more fun for you, but still! A giveaway a month! Wow! I’m looking forward just to seeing them every month. And I love this doll. My kids would love her but I want her for me. She is perfectly adorable! My little 5 year old ballerina would LOVE her. I enjoy seeing everything you create. She is just gorgeous! Thanks for the opportunity to enter the give-away! I love it! I’ve made your dolls for my niece. Now we have a new niece on my husband’s side of the family who’s getting to perfect doll age! Eeeee! She is adorable! I don’t know how you will part w her, but my dancing daughter would LOVE her! She is an adorable doll! What a darling! Her and you – a dolly giveaway is so sweet. Oh, so lovely! Our little miss would be so happy carting that curlyhead around the house. Thanks for the great giveaway! Her pink, curly hair is the best yet. I’d love to give her a home. My little girls would love her! Congrats also on all your doll success! I would be honored to have her come live at my house! She would have a lot of friends to play with here! My curly-topped girl would love her right up. So cute! We have your book at home! My seven-year-old LOVES to look through it and make up little stories about each beautiful creation! She would glow over this!! What a beautiful doll! I love her color combinations. I have a curly headed daughter who would love it. She is beautiful!!! I love your work! The hair is out of control!!! And I love it! Alas, all us straight haired girls. I love the fabric choice as well. So cute! Your things always are though! ooooooh the hair. I love it. Oh my goodness! She’s so adorable with her little tutu! And her curls remind me of my own! 🙂 Beautiful work! i love everything about her, she is awesome, as is everything you do! love the tutu!!! she is so cute! What a beautiful doll! And a chance to win her, so great! How do you do? =) This is one gorgeous doll. I would love to win it. Thanks for the giveaway! Hooray for lovely generosity and a one-in-a-million chance. Danka. Totally love the hair and soft colors! I really hope you’re gettting plans together for a new book. My kids , 3 girls and 1 boy, love the first one so much. What a sweet doll! My little girl would love her (as would I). Thanks! My daughter turns 3 on the 15th of February. This sweet February dollie would be a wonderful present! love her! would love to give her to my new baby ! Love! My little ballerina would love her too! Love her hair! All those curls give her so much character! You make such adorable dolls! So fabulous! My six and three year old girls would enjoy adding her to their collection. I’ve had such a fun time sewing the patterns from your book up for them. So crazy and fun! I love to see your creations. Oh, my! That hair! That dress! She is definitely in my top-5 of your creations. She is such a cutie! Hello! What a delightful idea. I could give that darling doll a very happy home. Thanks for the chance! Lovely little girl! My daughter and I would be thrilled if we won her! oooooh so cute! I thought she was based on Elsa Elf, so good to know its based on Winx….I”m going to look at your other doll patterns in a new way…. She is adorable and I love that you posted photos as you went along. I’m a little afraid of doing yarn hair, but you made it look do-able! She is super cute, love the curly pink hair! Oh I have two girlies who would LOVE her!!! My niece would adore this doll! She is so cute! Do you have any pictures or instructions to show how you made her hair? Oh my! I would love to own one of your dolls! I have made some from WW patterns, but this one is amazing. She’s lovely, especially her hair, tutu, and dress! i’d love to have her live with me! she is adorable and would love living at our house with 3 little girls. Super cute! Thanks for the giveaway! E has just started to enjoy her handmade dolls, which is just incredible. The first one I made her was from your book. Oh how do you do! My 9 year old would love her. You may be surprised at that, but she is a waldorf girl and fully appreciates handmade cuteness! She is as cute as can be with her pink hair, curls and tutu. My little ballerina would love to have a doll like that. Thank you for sharing how you made her hair. Oh! She is SWEET! I have some boring rag dolls who would love someone with a bit of personality to join them. Oh, she’s so adorbs! Luna would love to join her up with her already owned blue haired twin! Generous and sweet if you. She is lovely. Tutti fruitti hair!! That is so cute! My daughters would love her! I’d love to give her to my little niece!! Howdy! Love the pink curlies! I totally caught my breath when this photo came up, oh, my. I have your book, and if this doesn’t inspire me to start cutting out pattern pieces, there’s no hope for me! You are so generous to do a giveaway…thank you for the chance!! Wow, my daughter (or myself) would love her for a lifetime. How generous of you. What kind of yarn did you use for the hair? Or is it trade secrets? Such a sweet doll. I just bought your book because I’ve made each of my two big girls (6 and 4) waldorf dolls, but my newest addition needs something all her own and different. We adopted her from Ukraine eight months ago (she’s 20 months now) and she has down syndrome and is precious beyond precious. She keeps trying to swipe her sisters’ dolls and needs one of her own! I love the idea of fun colored hair…and even though I’m unlikely to win, I might be likely to steal some ideas! My big girls start gymnastics on top of horseback riding lessons (it has a name…voling? voleing?) so the outfit seems appropriate also. Any hint on where I might find that fabric? What a perfect valentine for my sweet 3 year old girly. eek! She’s adorable! Hope she gets to come live at my house! She is adorable! The hair is perfect!! Sakes alive! She’s perfect! Her hair makes me think of cotton candy and her tutu is too-too. SO cute! And I’ve loved the hair process posts too! Such a cute lil’ strawberry blonde girlie. I’m sure she’ll get a good home (hopefully mine). Who knew pink hair could be soooo cute. Adorable! Love the colors and the hair is perfect. Oh my, I don’t know how you could bear to give her away! She’s beautiful. I’m keeping my fingers crossed. She’s adorable! I’d love to win her. I so want her to come live with my us! I’m sure my nieces would love to play with her! She’s so cute! You do great work. Oh my, she is the cutest!! woo-hoo! how fun. I think she’d enjoy living at our place (my oldest daughter is a curly top too!). You are so talented-would love to win one of your dolls! She’s fabulous! Thank you for the opportunity to win her! My 5 year old would certainly give this sweet girl a good home! HOW SWEET! my daughter (and I) would LOVE this!!! She has a bunch from your book (which she calls her dolly book), and this would be awesome to add to her collection! She’s adorable! Love her hair! She is soooo sweet! My daughter would love her! She is so sweet. I think she has confetti in her hair. My daughter would love her. Thanks for the chance. I just made Melvin and am about to try Olive. Love your work! So adorable! We’re expecting a baby girl in June and this little lovie would be perfect! Thanks for the opportunity! I have a feeling this spunky girl wears her tutu wherever she goes–not just to ballet class! Your dolls are a true crafting inspiration. We would love one for our little guy! She’s adorable! My 6yo LOVES the Juliet doll you made and sleeps with her every night. If I win, this is going to her little sister who is 4 and loves ballet as mich as her big sis! Love the hair and the tutu! Super cute! My girls would love her to pieces! You are so creative! She would be loved at our home! Oh, dear, my daughter would absolutely giggle with joy to have this doll! She’s adorable! My youngest said she would love to have her come live at our house! I love your dolls! I’m in awe of your hair skills. Thanks for the give away. I just have to tell you, her hair is my favorite! 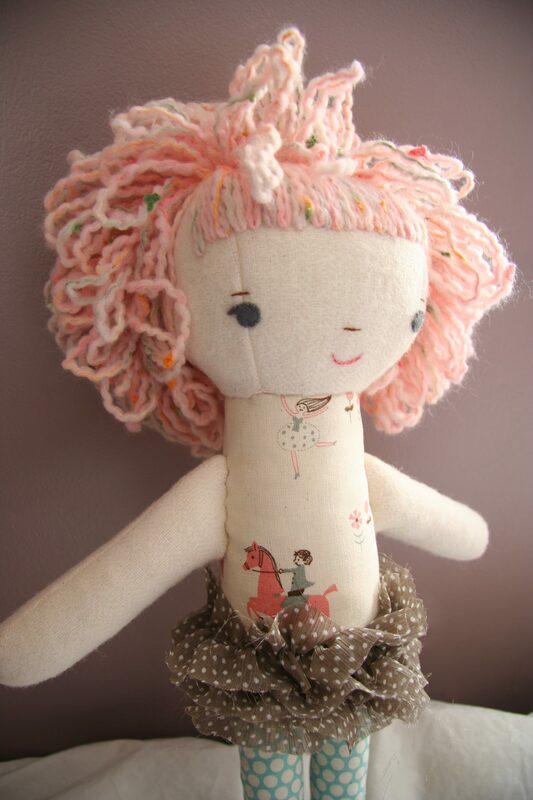 I know a little girl turning 1 soon who would just love a little pink haired friend. Oh man she is cuuute. I want that hair for myself. Is that weird? I love her hair! I bought your book and made two dolls for my little girls. I’m hooked! Hilary quality hair is a skill I’d love to accomplish one day! I’d love your little lady to keep my wee wonderful patterns company! Too cute! Hillary I love your book and have made several dolls from it. You are inspiring. I would love to add curly top to her Wee friends in my home. I’ve admired your work for years! I’ve tried a few of the patterns, too, but none look as good as yours! Thanks for the give away. she’s really a special lady. Love that pink hair! Cloth dolls are my favorite. I can’t express how much my little girl would adore this pink haired beauty. She’s just lovely! She is adorable! Love the curls!! She is adorable. The hair, face, outfit . . . very cute! I just love the hair. I know my girls would just love this doll. Very sweet curly top! Love her! Oh my gosh I love her so much. I need to make one NOW. Congrats on having your designs in the Land of Nod catalog. She turned out absolutely adorable!!! Loved following the progress. Love having the chance to win her. thanks! My little lana would LOVE this!! :D ADORABLE!! I’ve been eyeing your dolls forever, we would love to win one!! Love her tutu and polka dot legs. What a sweet little doll! Oh good grief! The cuteness is so intense. You, my dear, are so generous. This is a giveaway to get excited over! Yahoo! Would love her…just for me…to put her on my desk at work to cheer me up every day. Wow… she’s great!! Excited to see each month’s creation. Love this doll. Would be so happy to win it! Oh wow! She is lovely! oh my stars! she is perfect! i would feel so lucky to have her come live with me! Love the curls! And the tutu!! I’m 52 and I would love to win that doll! A giveaway? How kind! As much as my twins would love her, I may be hoping to win her for myself. Darling. I have three daughters who would love this! howdy do hilary! LOVE her! This might be the best doll I’ve ever seen. Love, love, love! She is fantastic! That hair is a hoot! She is precious!! A tutu and pink hair? Can it get any more girly and sweet? By the way, we made an Eddie (from your book) yesterday! Love! Oh my goodness…she is adorable. I’d be lying if I said I wanted it for my daughter. I totally want it for me!! WOW she is gorgeous. And her colors would match my new sewing room perfectly. Would Love her to come and live with me and my two daughters!! She is adorable!!! Love her! She is so stinkin’ cute! LOVE theto hair. She would make a perfect addition to my daughter’s collection, right next to our advent calendar Goldilocks and the 3 bears. Thanks for sharing her! She is beautiful. I know just the little girl to pass her on to. Count me in for the doll. It’s a guarantee that one of my daughters would love that doll! WOW she is so pretty!!!! I have three girls who would love her, but I might have to keep her for myself! My great niece Maggie turns one next month.She would love this doll. (She is the happiest baby,with big smile for everyone. )I love to send her this doll! My niece would LOVE her! I would love her! LOL Her hair is wonderful. You are so talented. She is beautiful! Thanks for the giveaway! My little lady would adore this pink haired cutie! Oh she is muy bonita! I know a little curly haired girl who would adore her. she’s just perfect!! LOVE the fabrics and colors. So cute. Love how the hair turned out. What a cutie! Love the yarn color for the hair. This doll is precious. I love everything about her, from her pokadot legs and printed body to her ruffled skirt and pink curls with “highlights”. “How do you do!” My daughter would love her! Love curly top! That hair is just getting going!! Oh my is she precious! Look out Land of Nod! Thanks for the chance to win. She would be right at home with the many dolls I have made from your patterns. I have the perfect little girl for her. She would be very much loved in our home! She’s so sweet! My daughter Adelaide would love her up. This is such a generous giveaway. Thank you! That doll may be the cutest thing I’ve ever seen! Oh, she’s the sweetest! My little girl would love the pink hair and tu-tu!! That doll is adorable and my 3 year old would absolutely LOVE her! I love all of you dolls! oh, me please! my Abby would LOVE this! !